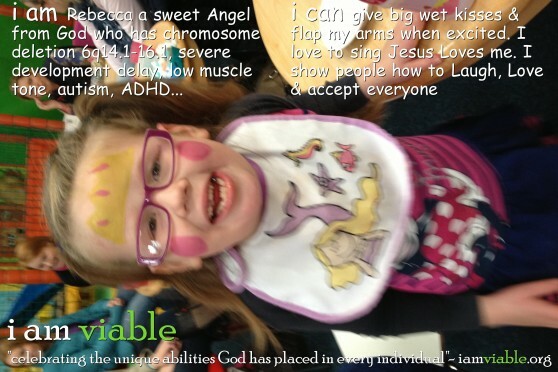 Rebecca has chromosome deletion 6q14.1-q16.1. As a result of her syndrome she has severe development delay, low muscle tone, hyper mobility, sensory processing dysfunction, ADHD, autism, short sighted with both eyes tiring out and depth perception problems, severe behavioral problems, channelopathy neurological disorder, and slight hearing loss. Psalm 139 in Gods word tells us each child is a miracle of Almighty God made in His image. We are Unique, not meant to be compared to anyone else because God does not make mistakes. We as Rebecca’s parents see her through the eyes of Jesus – beautiful, complete, full of God given potential with a purpose and a destiny.